This Mardi Gras recovery Sunday, some of Sydney’s most celebrated queer performers come together to present an audacious and low-brow recovery party at the Vanguard in Newtown. 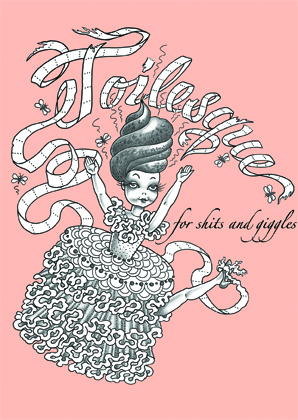 Brought to you by Australian burlesque star, Lillian Starr and Dirty Queer Magazine’s Xavier Moustache, “Toilesque – For Shits and Giggles” is an opportunity to laugh and indulge a bit of the lowest-common-denominator humor. The night is in response to the misconception that burlesque is only a ‘classy’ form of entertainment. In fact, some of the most talented and glamorous performers we know of have a show or two in their collection that is totally low-brow and bad taste. Did you know that showgirls often poo glitter? What’s not glamorous about that? “Australia’s Assiest Burlesque Show” will feature some of Sydney’s most accomplished queer performers, including Australia’s Queen of Burlesque Imogen Kelly (Imogen Smelly) and queer burlesque icon Glitta Supernova (Glitta Poopernova). Also performing on the night will be queer performance duo Fancy Piece (Fancy Piss), ex-beauty queen Betty Grumble (Betty Bumhole), Harvest Festival favorites The Glitter Militia (The Shitter Militia), outrageous drag circus performer Solid Gold (Solid Load) and ‘spoken turd’ and musical interludes by ZooFi (PooPee). The night will be hosted by Vanguard favorite Drew Fairley (Poo Fairley), with “a sweet release of tunes” from Mardi Gras favorite DJ Sveta (DJ Svenema). This night is an opportunity to laugh with a crowd of fabulous queers in the luxurious environment of the Vanguard. Come down, bog in and unload with a night of low-brow shows at the end of your Farti Gras weekend.